AboutWelcome to my website! Find out who runs this place. Are you searching for a reasonably priced piano that offers great quality? Well, whether it’s your first purchase or a replacement option, look no further than the Casio LK-240 61-key Portable Touch Sensitive Personal Keyboard. 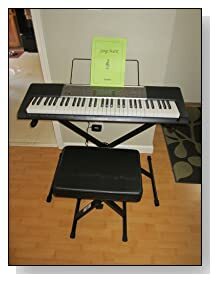 Highly versatile and easy to use, this keyboard uses an intuitive system and has a ton of useful features that make learning the piano simple. Ideal for both the young and not-so-young, the Casio LK-240 keyboard offers a fun way to play the piano. The Casio LK-240 61-Key portable keyboard makes a great learning tool as it enables you to advance from beginner to advanced piano player in a very short amount of time. The keyboard uses one of the most helpful learning systems in keyboard technology – a simple step up lesson system. This learning system breaks down lessons into simple learning units, which are further broken down into step-by-step easy to master lessons. 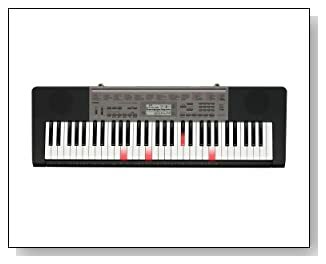 Once you’ve mastered the various components of the broken down lessons, the Casio LK-240 keyboard then puts everything together for you to play from start to end in one go. Imagine you as a novice piano player being able to play beautiful melodies like a pro the very first time you touch a keyboard. Amazing right? Well, that’s exactly what you get with the 61-key Casio LK-240 keyboard. This keyboard features 61 piano style keys which light up to show you which keys to push during a particular song or tune. With this feature, you get all the support you need to improve your play quickly and easily. After perfecting your play, you can turn off the illumination keyboard feature and play songs from memory. Do you have a complex song you wish to learn? Or perhaps you’re looking for an easy way to play the tunes of your favorite songs? Well, the Casio LK-240 Keyboard makes this possible as it features a voice pad function that enables you to playback voice samples and other sounds/effects. As a result, you can replay a song repeatedly until you finally master all the notes. The 61-key portable Casio LK-240 Keyboard boasts of an “Acoustic and Highly-compressed Large-waveform” (AHL) technology that reproduces realistic tones from pianos to organs and more. So, all notes played will sound like a real piano. In addition, the keyboard has an AHL sound source which has an inbuilt 400 tones, 150 rhythms, and 110 songs. And that’s not all. The Casio LK-240 Keyboard also features 48 notes of polyphony that ensure all sounds played are heard loud and clear even when you hit complex notes. These 3 features combine to give the Casio LK-240 keyboard an unlimited potential for producing great pieces of music. Be sure to check out the bundle package too. 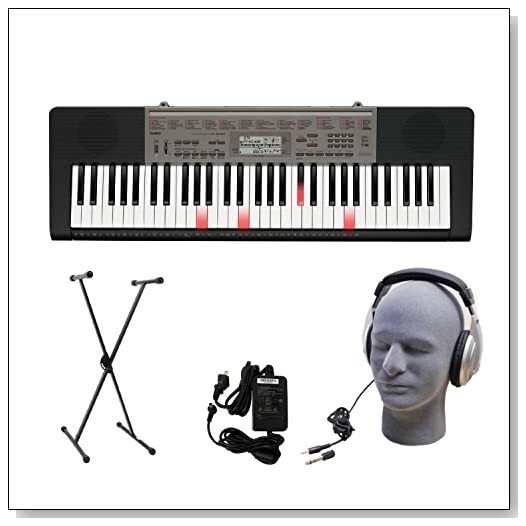 It comes with the Casio LK-240 keyboard, headphones, stand, and power supply. The portable Casio LK-240 keyboard measures 39 x 5.2 x 15 inches. The Casio LK-240 Keyboard appears to be a keyboard that excels in functionality and sound quality. Many satisfied customers have left their thoughts at various piano forums, saying that Casio’s LK 240 61Key piano keyboard has met all of their needs exceptionally well. So, it’s safe to say that this piano would make a worthwhile purchase that will leave you with little to no regrets. Whether you’re looking to learn the basics of piano playing or hone your skills, the versatile Casio LK-240 Keyboard is the way to go. This keyboard will provide you with everything you need for your piano playing endeavors. From wonderful acoustic features to portability and user friendliness, this keyboard has a lot to offer. With its amazingly low cost, it should definitely be one of your top choices when shopping for a good quality piano keyboard. Copyright © 2016 Pianist Corner.